The Vancouver Condo Buzz » Boutique Living on the North Shore now available at THE VUE North Vancouver Marine Drive Condos! 4 Storey Low-Rise Building with Great Features! 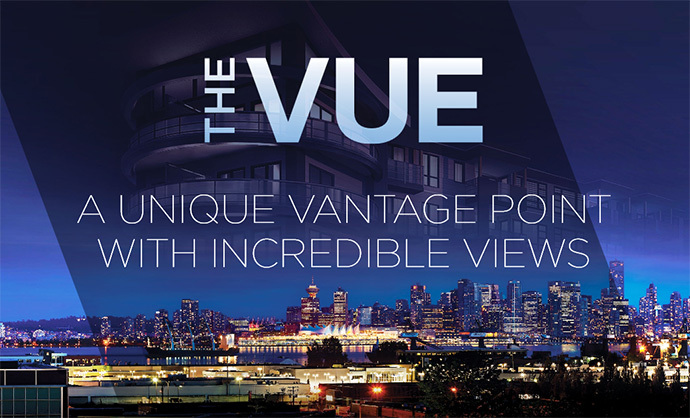 Boutique Living on the North Shore now available at THE VUE North Vancouver Marine Drive Condos! 4 Storey Low-Rise Building with Great Features! A unique vantage point with incredible views is offered at the new North Shore VUE condos. Enjoy an energetic Marine Drive North Vancouver neighbourhood that is in harmony with all of life’s conveniences. Just steps from prime shopping, retail and dining as well as minutes away from recreational hotspots and parks as well as the natural beauty of the North shore, THE VUE North Vancouver condos are now selling. The project site is 850 Marine Drive North Vancouver. The iconic building features a 4 storey boutique low rise development that is both contemporary and striking. There is imported Nichiha fiber cement siding for a polished minimalist look and feel and the ground level will have boutique retailers. The top 3 floors will be residential. THE VUE North Shore condos will have wide street boulevards complete with benches in addition to large open air outdoor living/entertainment spaces for all homes. There is a shared bike room and individual storage lockers. The entrance features a beautifully appointed lobby and the penthouse units will have over height ceilings. The design of the building both inside and out is focussed on sustainability with hot water heating in floor on the top 2 floors. The second floor has hot water baseboard heating. All homes have low VOC paints, adhesives and sealants to improve indoor air quality and there are huge glazed windows with screens. THE VUE North Vancouver condos will have recycling and garbage facilities in addition to a prime location that is walkable to all community amenities and services. There is also an adjacent bus stop. The landscaping is drought tolerant and the windows are energy efficient and low E glazed. The bedroom windows on Marine Drive North Vancouver VUE condos have an additional layer of glass for sound reduction and the building envelope has the latest in rainscreen technology protection. All homes at THE VUE North shore condos for sale come with a comprehensive 2-5-10 year warranty by National Warranty Program. More information about the presale North Vancouver VUE condos on Marine Drive is online at www.lifewithavue.com. In addition to the many benefits of the Marine Drive North Vancouver location as well as the building features, the interior finishes are also a great selling feature at this development. The homes have premium engineered hardwood floors throughout the kitchen, entrance, dining and living room as well as flat profile painted baseboards and casings. There are living room crown mouldings as well. The beautiful kitchens at THE VUE North Vancouver apartments include an energy efficient full sized stainless steel appliance package by GE as well as a waste disposal unit, Corian counters, stainless steel under mount sink, sleek, full height glass tiled backsplash in addition to contemporary custom wood veneer cabinets with stainless steel modern hardware. As well, the kitchens at the North Vancouver VUE apartments come with polished chrome faucet with extractable spray spout, track lights, pendant lighting and puck lighting under the cabinets. The beautiful and elegant bathrooms at THE VUE North Shore apartments come with high efficiency water conserving lavatories, beautiful imported porcelain tiled flooring and oversized mirrors with contemporary light fixture. Other bath features include polished chrome bathroom accessories, spa inspired deep soaker tub, tub/shower that are fully tiled and under mount wash basin with chrome faucet. THE VUE North Vancouver apartments for sale also come with designer selected limestone or granite counters and custom wood veneer cabinets with modern hardware like in the kitchens. Some other incredible interior features at THE VUE North Shore condos include a high efficient front load washer and dryer, high speed internet, digital media pre-wiring, and horizontal window coverings throughout. All homes at THE VUE North Vancouver Marine Drive condos come with pre-wiring for an in-suite security alarm system, state of the art fire protection system, solid maple suite entry doors with peep hole and enter phone system. The building is secured by electronic key fobs and the underground parkade is bright and secure. THE VUE Marine Drive condos in North Vancouver features 3 levels of residential homes in this up and coming established neighbourhood. Level 2 features homes that are between 615 square feet to 786 square feet and includes 1 bedroom/1 bath, 1 bed+flex/1 bath and 2 bedroom and 1 bath layouts. Level 3 has even more variety of THE VUE North Vancouver floor plans that range in size between 615 and 792 square feet. They include a combination of 1bed/1bath as well as 1 bed+flex/1 bath and 1bed+den/ 1 bathroom units. There is also 1 two bedroom and 1 bathroom layout on the third floor. The North Vancouver VUE Penthouse level features a great range of layouts as well that include 1 bed/1 bathroom to 2 bedroom and 1 bathroom units. All of these homes have over height ceilings on the penthouse floor.